All photos by Zara Brown, member of the US delegation, unless otherwise noted. 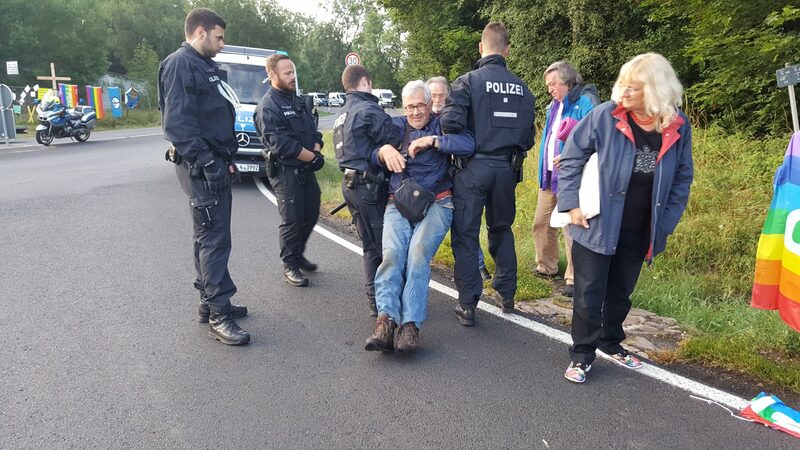 We shall not be moved. 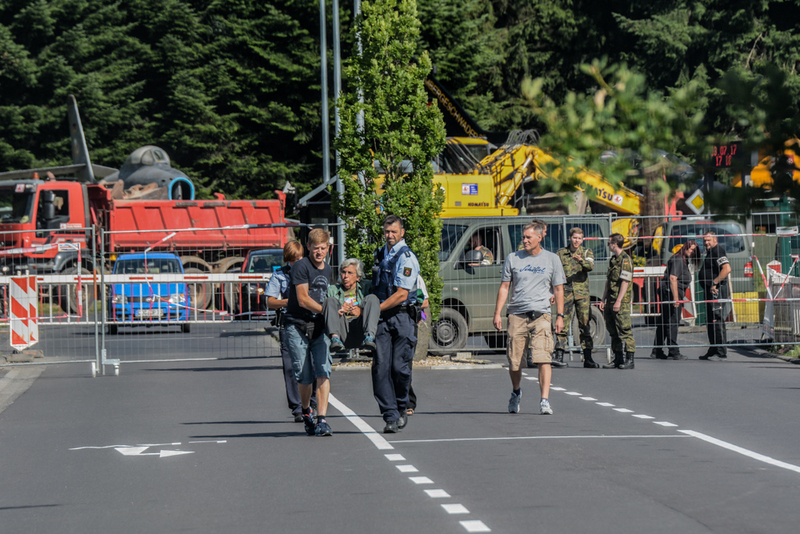 The international delegation took over an entrance to the Base as a police van approached. 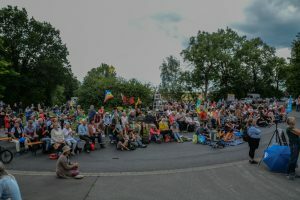 The blockade sat down reinforcing their position. 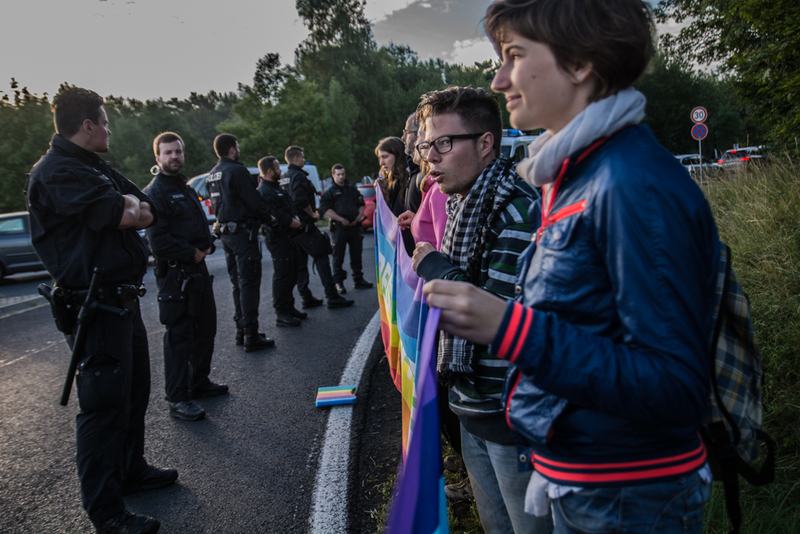 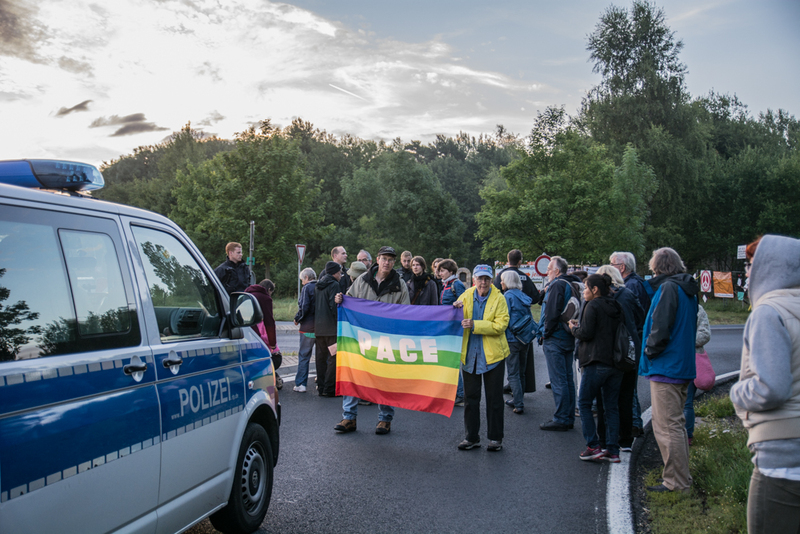 Police lined the blockade, which formed again alongside the Base entrance. 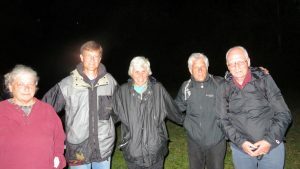 These five got farther into the supposedly high-security base than any others had managed to in two decades of “go-in” protests here. They crossed lighted fields and roads, tramped noisily through several woodlots, clipped through four chain-link fences, and climbed atop a huge weapons bunker that may have contained nuclear weapons — all without being detected. 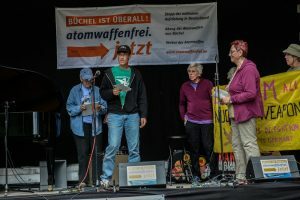 (Photo by Ralph Hutchison) Read more about their action. 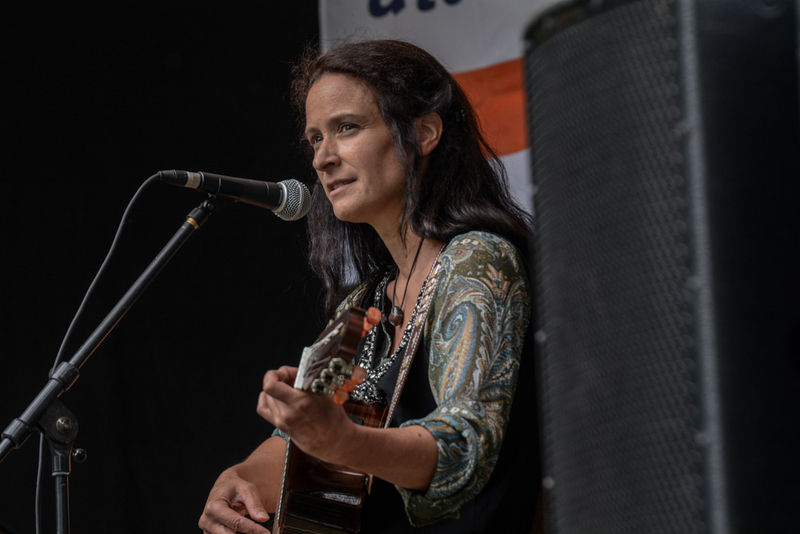 To view more of Zara Brown’s pictures from Day 4 click here. 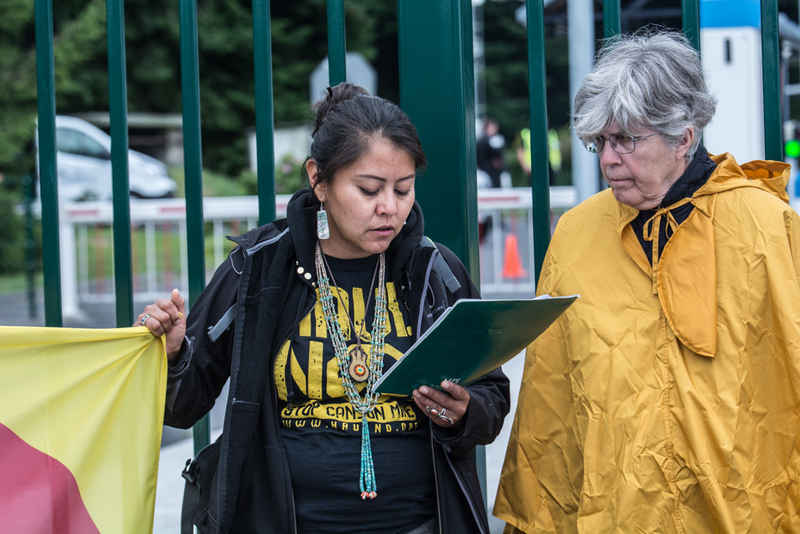 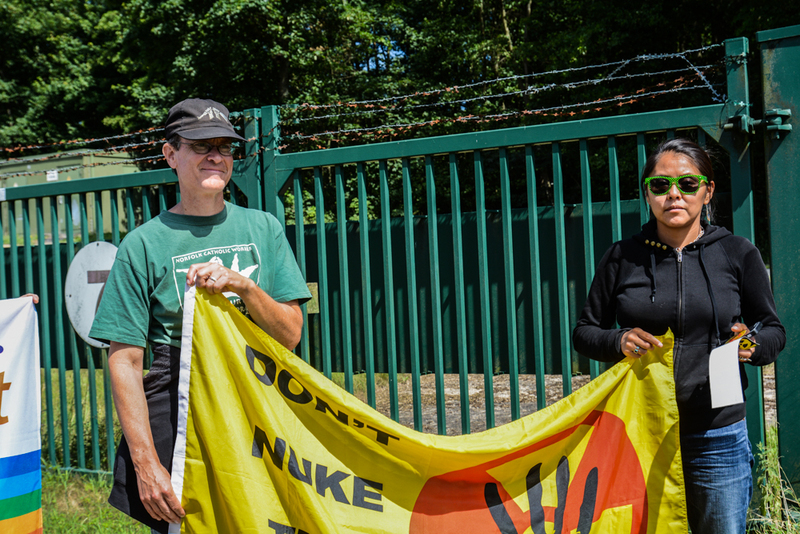 Leona Morgan of Diné No Nukes and Carol Gilbert, OP at the gates to the Büchel Air Force Base. 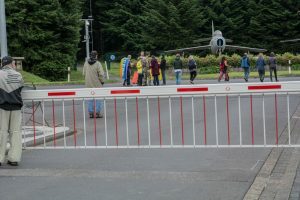 On Sunday the 16th, a pair of firsts was accomplished when a group of 50 protesters, accompanied by photographers and reporters, walked through the same gate and toward a “hardened” steel inner gate which was for the first time anyone could remember left inexplicably unlocked. 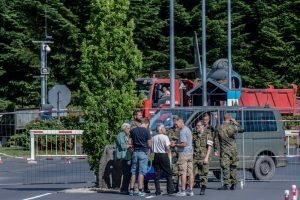 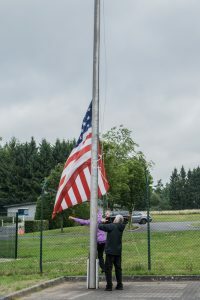 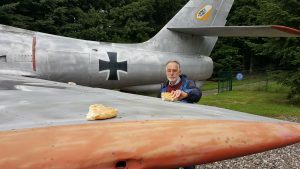 At least 30 of us traipsed through the open steel door, fanned out, and began inspecting the otherwise exclusively military surroundings and their gaudy display of three retired war planes on pedestals. 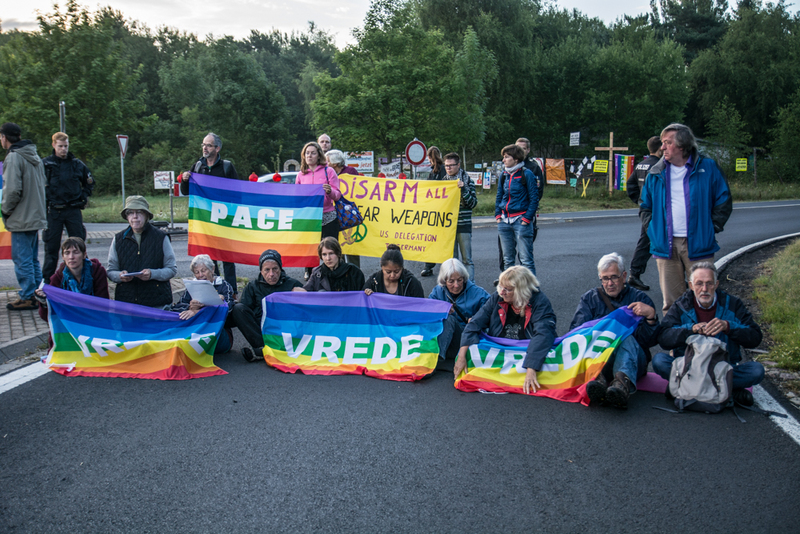 To see more of Zara Brown’s photos from Day 3 click here. All photos by Zara Brown, member of the US delegation. 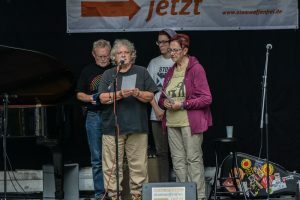 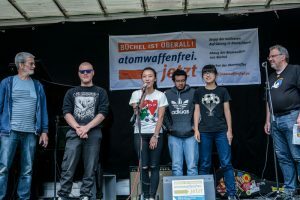 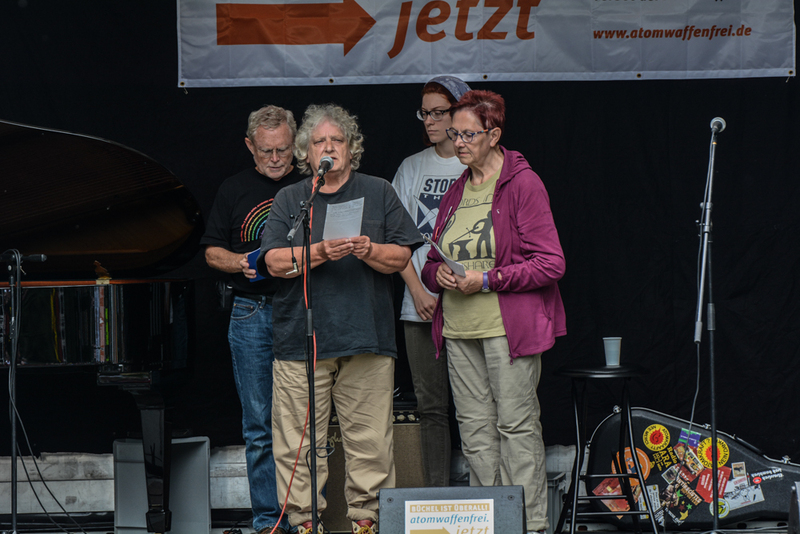 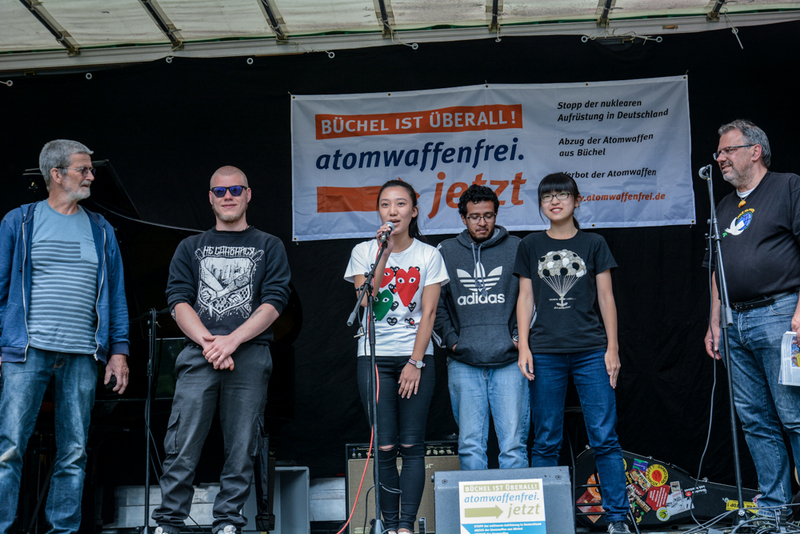 On the second day of International Week local supporters of the campaign gathered for the musical event, Wake Up Call Germany! 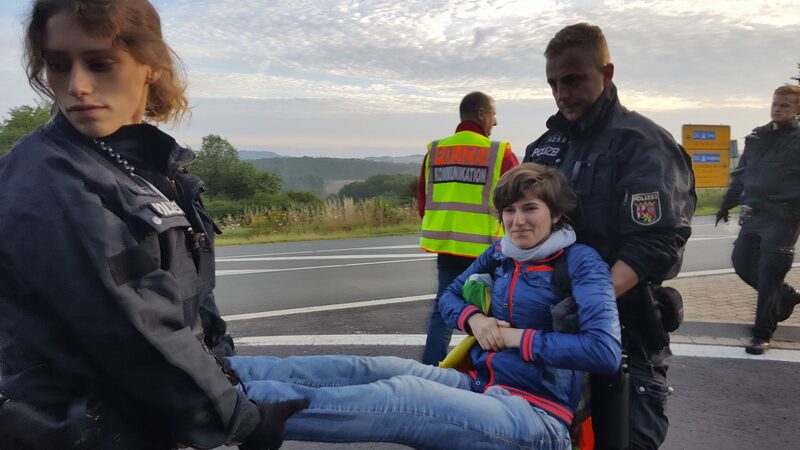 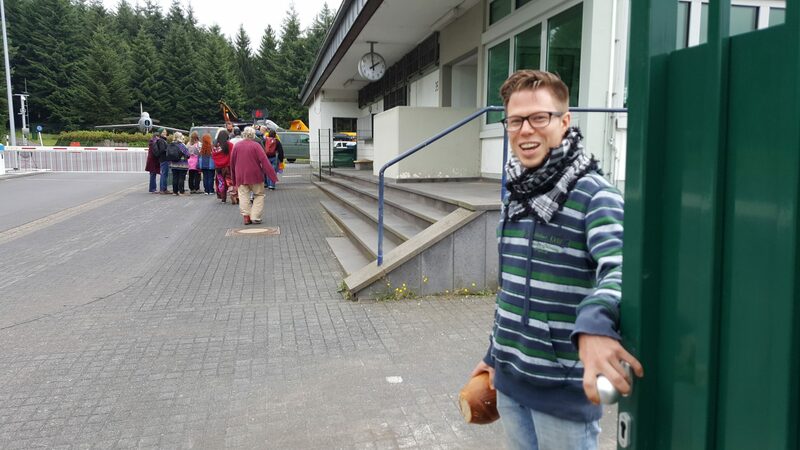 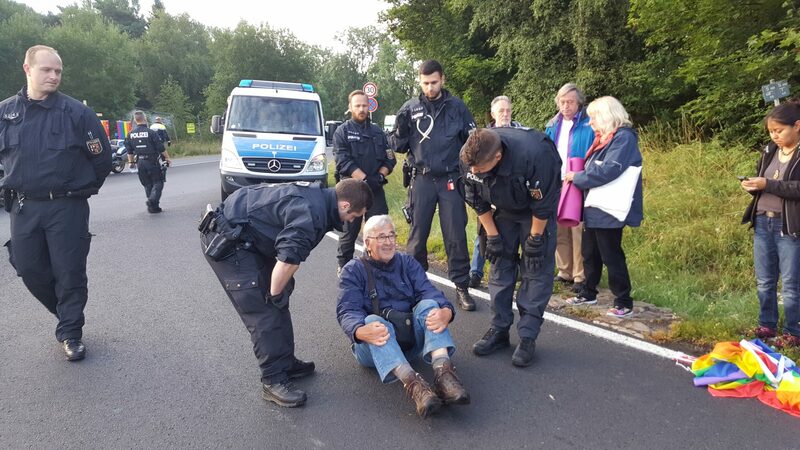 “Radio-activists” performed some theatrical “early warnings” at the main gate Saturday morning. 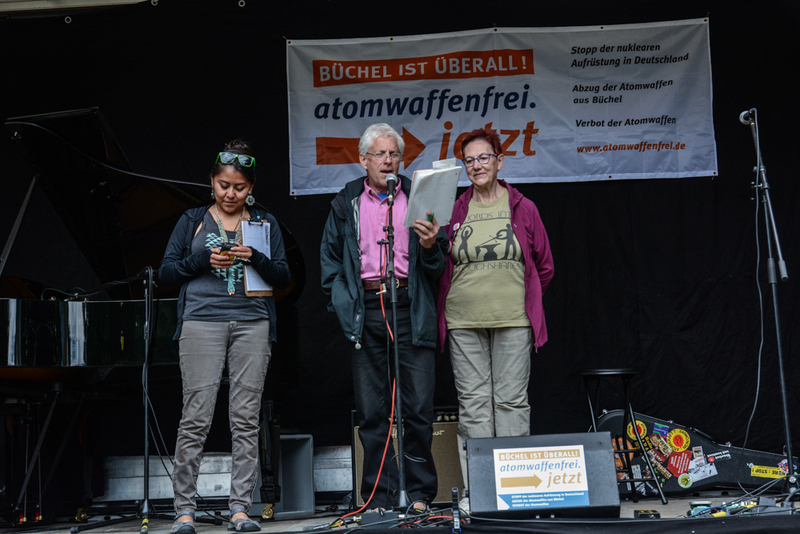 Konstantin Wecker (left) and Marion Kuepker (far right) joined in opening the concert. 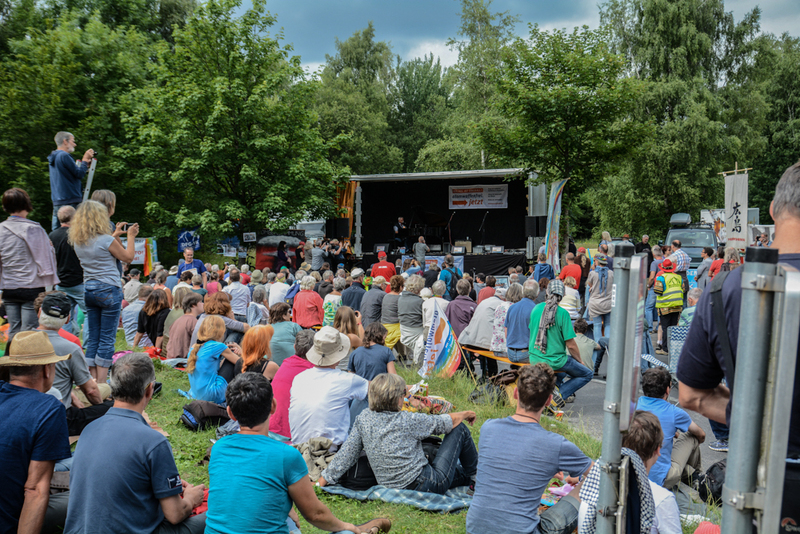 Concert- goers gathered in the afternoon for the musical event Wake Up Call: Music Not Bombs. 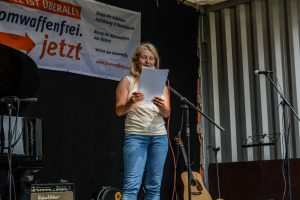 Marion Kuepker, international coordinator for DFG-VK and peace camp organizer, moderated the concert gathering. 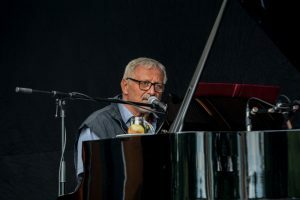 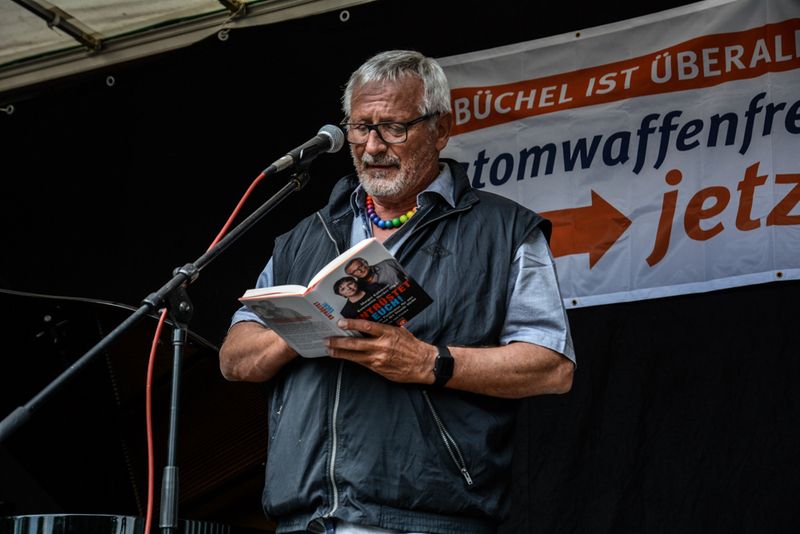 Renowned singer/ songwriter Konstantin Wecker performed and read some original poetry. 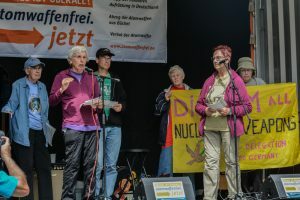 Susan Crane and other members of the US delegation, spoke from the stage about their work for nuclear weapons abolition. 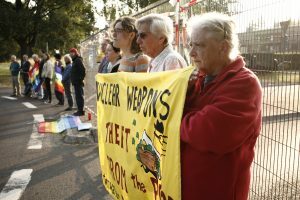 Carmella Cole and Ralph Hutchinson of the Oak Ridge Environmental Peace Alliance spoke about the Y12 nuclear bomb plant. 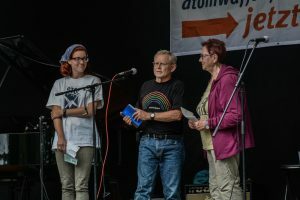 See video of their talk here. 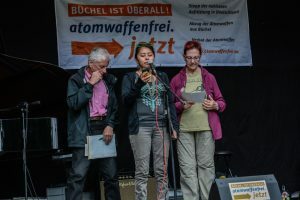 Nicole Mercier performed in solidarity with the encampment. 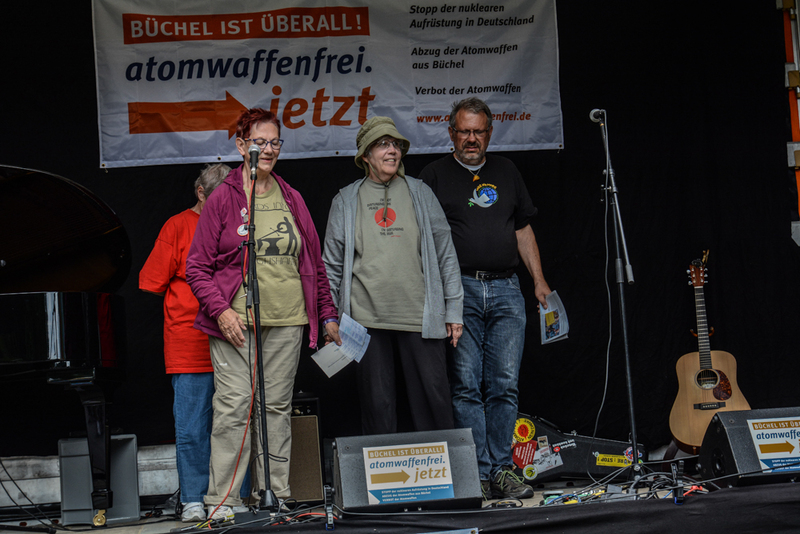 Sr. Ardeth Platte, OP spoke of her participation in UN nuclear weapons treaty ban negotiations. 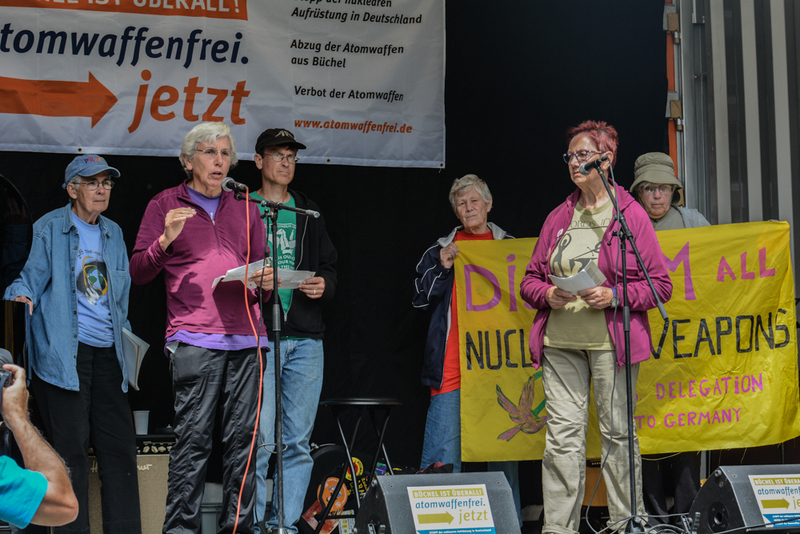 Sr. Carol Gilbert, OP also spoke about the successful adoption of the UN nuclear weapons treaty ban. 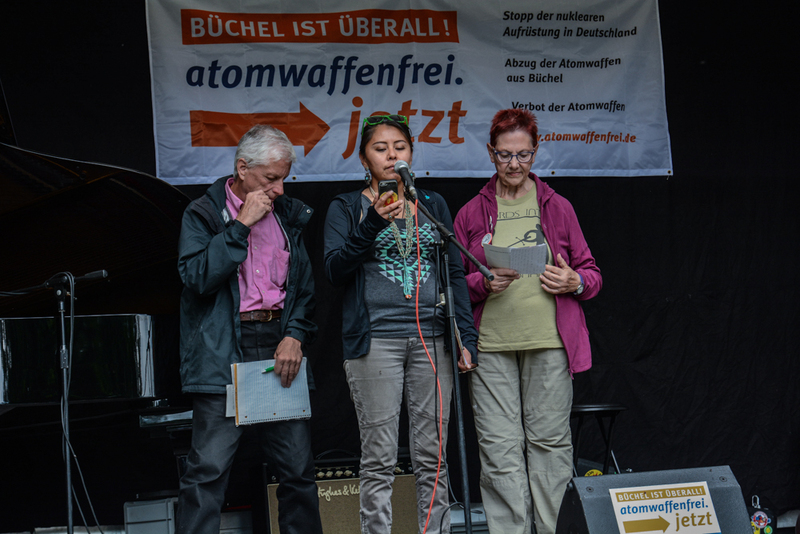 Members of the Youth International Work Camp representing Mexico, Russia, Germany and China spoke from the stage. 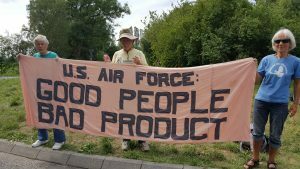 Steve Baggarly of Norfolk, Virginia Catholic Worker spoke about the Catholic Worker commitment to nonviolent anti-militarism. Bonnie Urfer, board member and former longtime staffer of Nukewatch spoke about the long prison terms given to US nuclear weapons resisters. 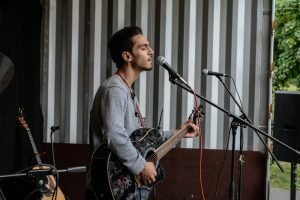 Mohammed Koshary, recent refugee to Germany from Syria, performed freedom songs. 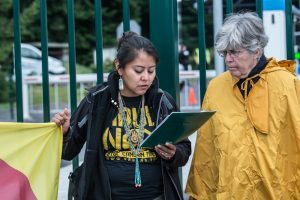 Leona Morgan of Diné No Nukes spoke about the impact of the nuclear chain on indigenous lands and population around the world. John LaForge of Nukewatch spoke about the mental illness of becoming comfortable with nuclear weapons. 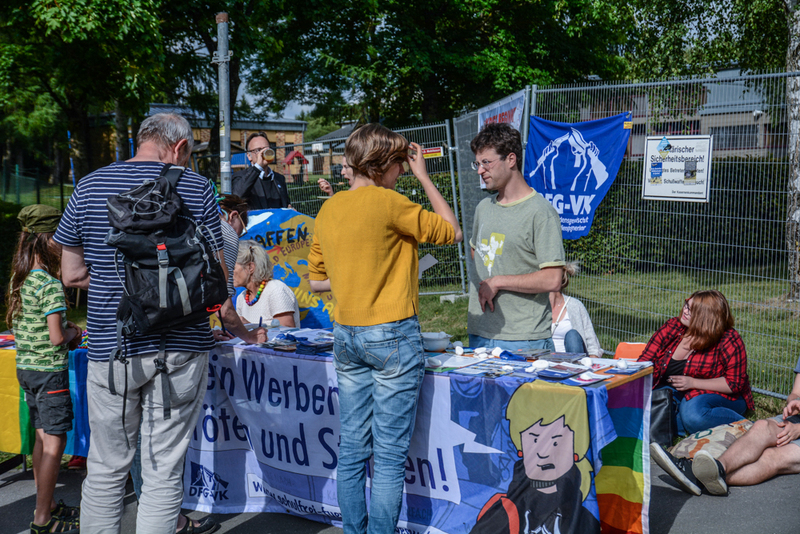 Info tables made a part of Sunday’s concert gathering and demonstration. To see more of Zara Brown’s pictures from Day 2 click here. 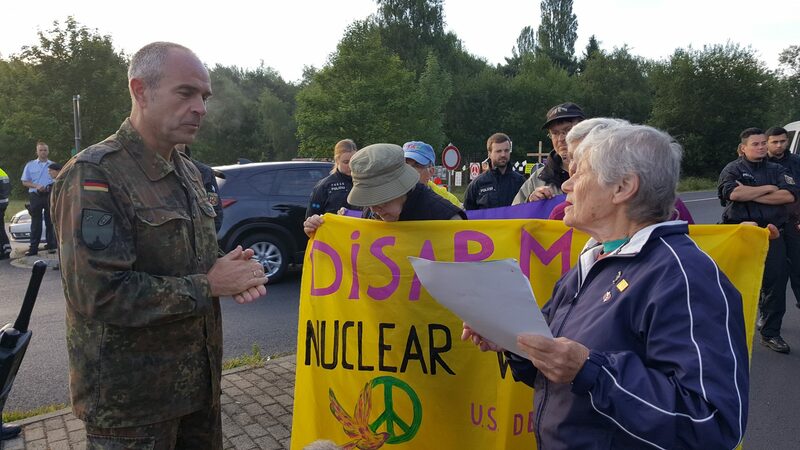 At the peace camp near Büchel Air Base in Germany July 14, international campaign coordinator Marion Küpker, of Hamburg, Germany, explains some protest history and the likely consequences of civil resistance at the base during “International Week.” “Büchel is Everywhere: Nuclear Disarmament Now!” is the theme of this year’s 20-week-long camp. 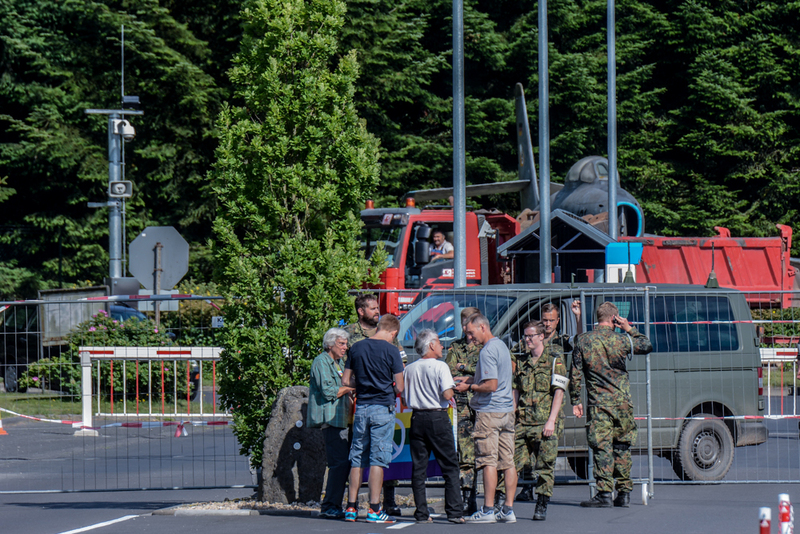 US delegation and German colleagues visited the base’s nine entrance gates. 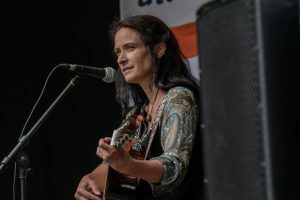 Photo by John LaForge. US delegation and German colleagues visited the bases nine entrance gates. 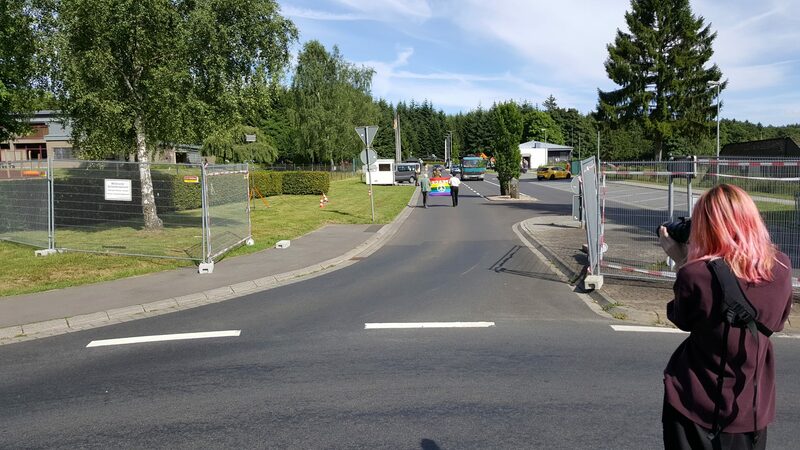 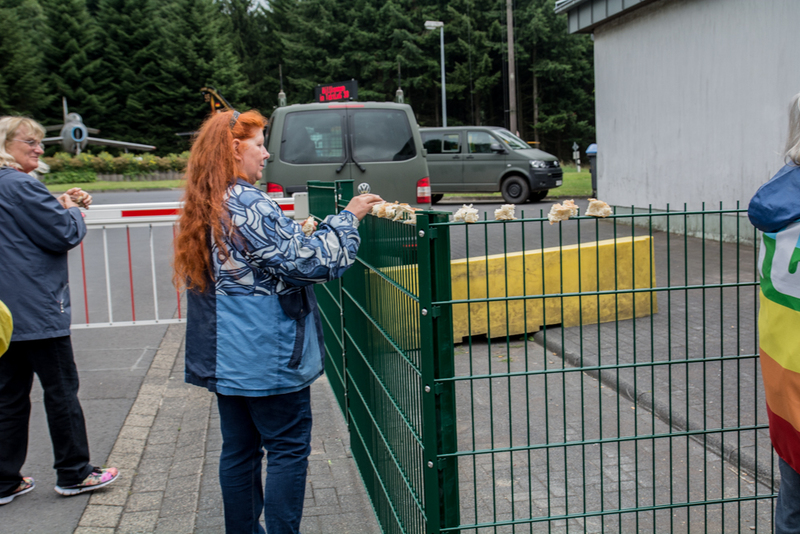 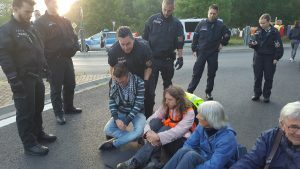 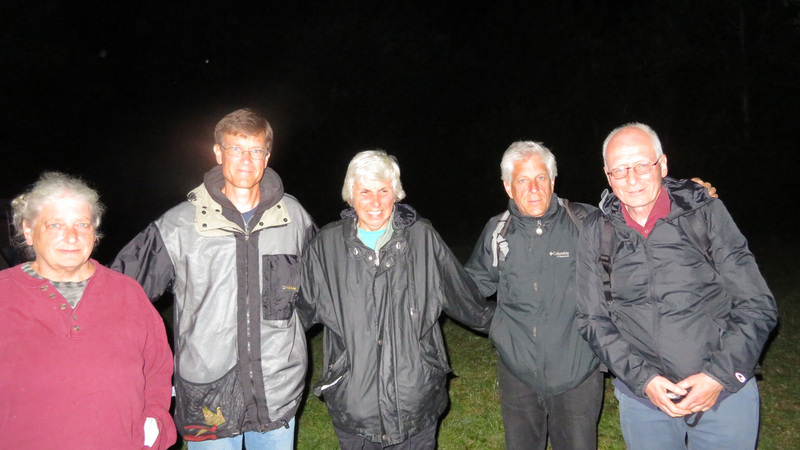 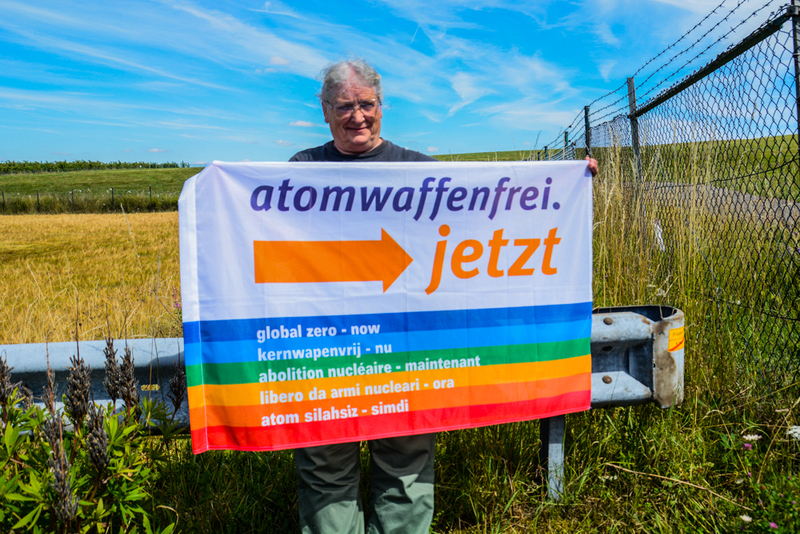 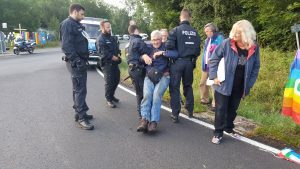 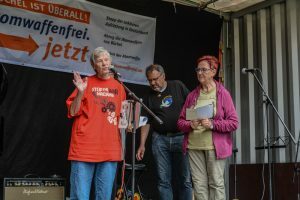 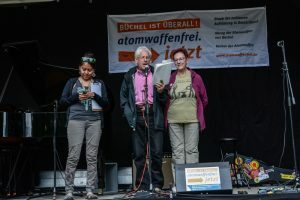 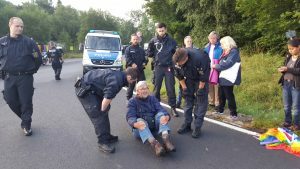 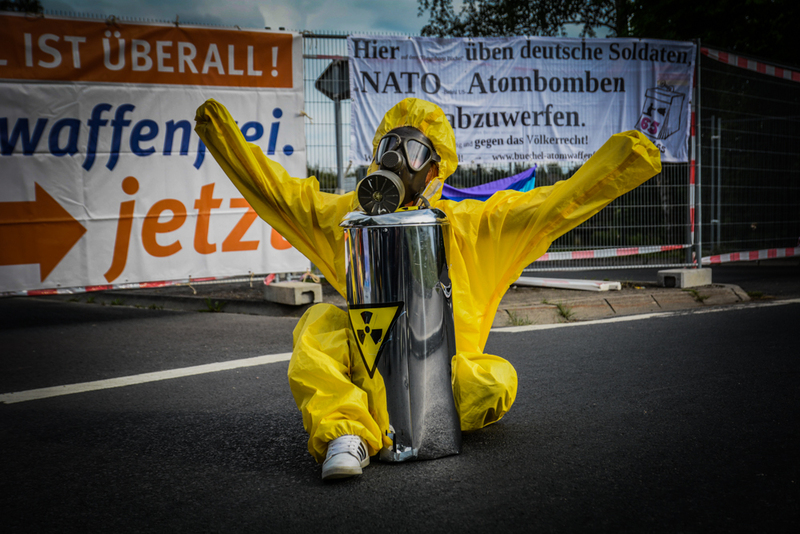 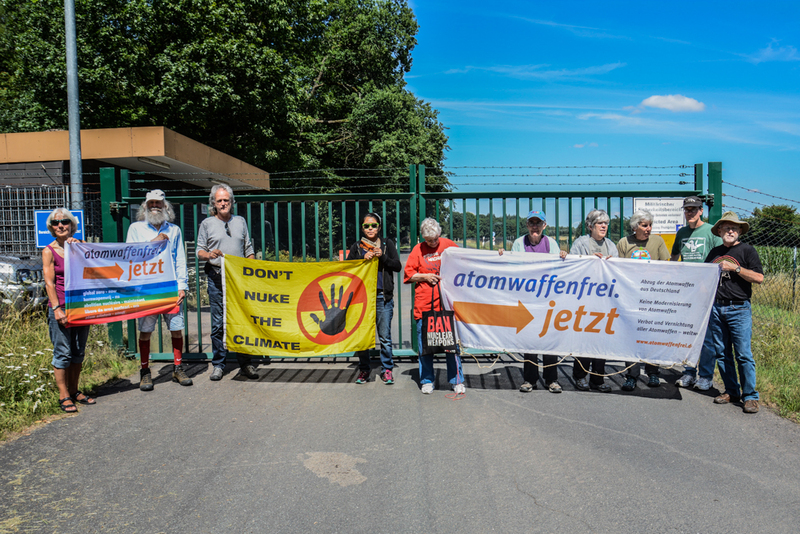 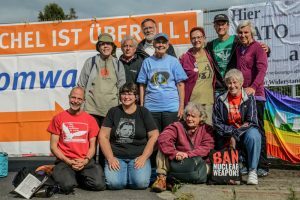 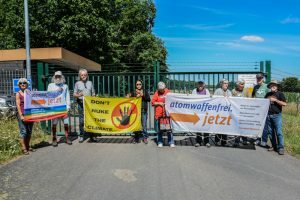 Steve Baggarly of the Norfolk, Virginia Catholic Worker, and Leona Morgan of Albuquerque, New Mexico and Diné No Nukes at one of the gates into Büchel Air Base in Germany. 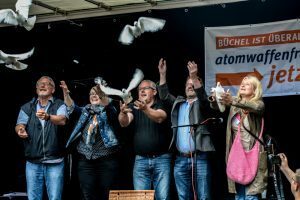 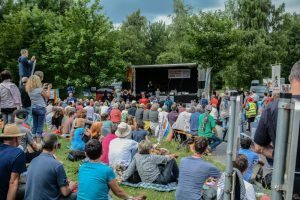 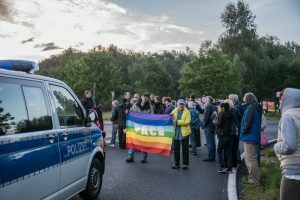 A delegation of 11 from the United States joined “International Week” at a peace camp near the base focused on the illegal B61 hydrogen bombs deployed by the US Air Force there. 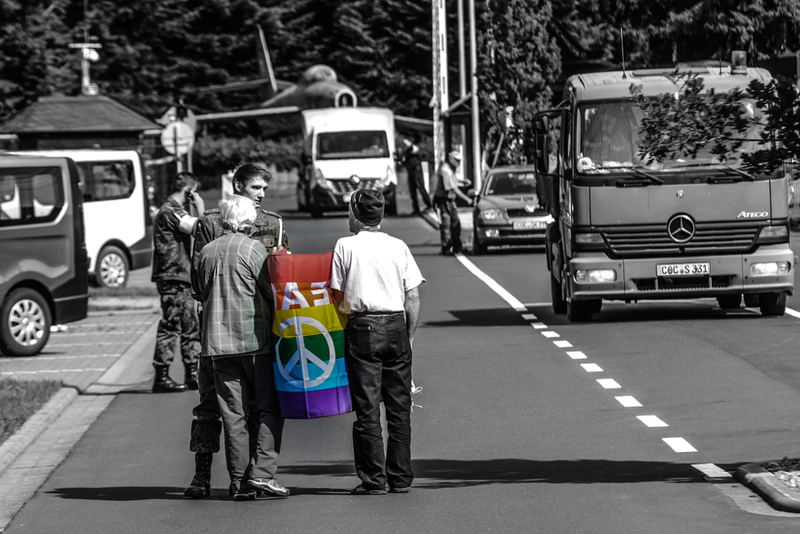 Banners adorn the road approaching the base’s main gate. 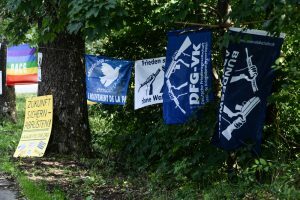 “DFG-VK” is the oldest peace organization in Germany, this year celebrating its 125th anniversary. 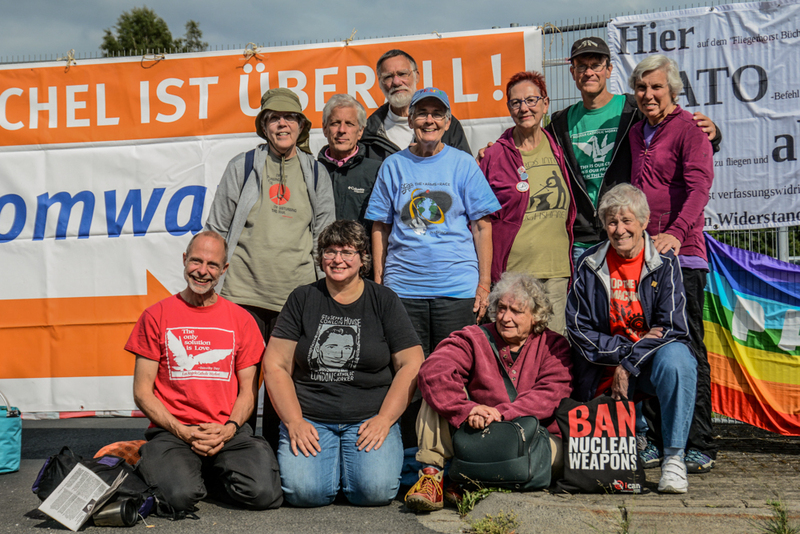 Susan Crane of the Redwood City, CA Catholic Worker and John LaForge of Nukewatch walked into the base test the response of the German authorities. 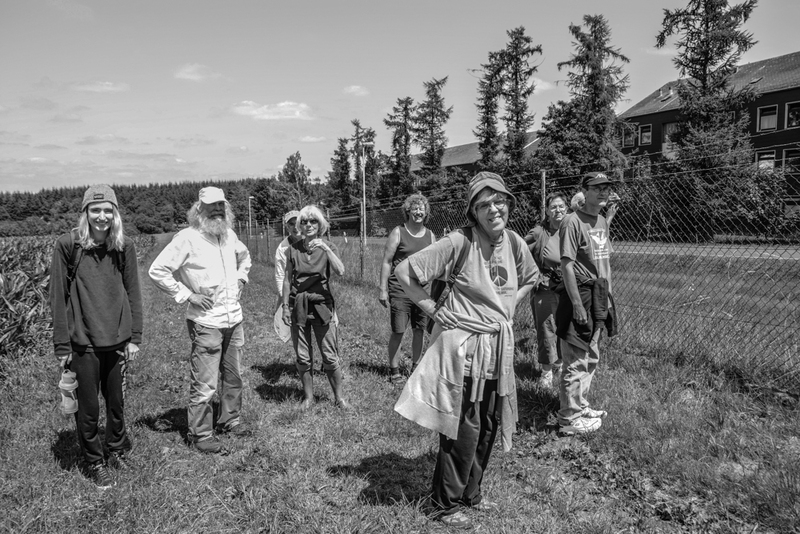 Susan and John had a long conversation with base guards and later civilian police investigators (in shorts) demanded that they leave. 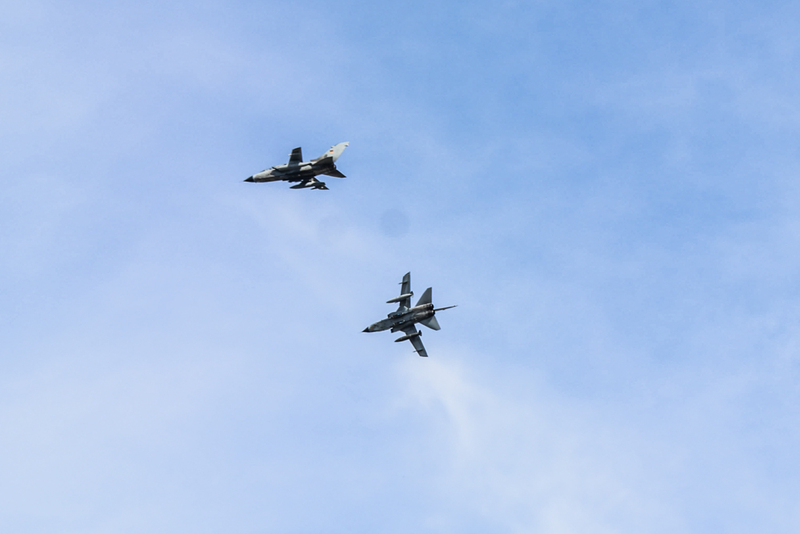 (Panavia) Tornado jet fighter bombers scream overhead disturbing the otherwise bucolic atmosphere. Jets like these pictured make regular test flights from the base. 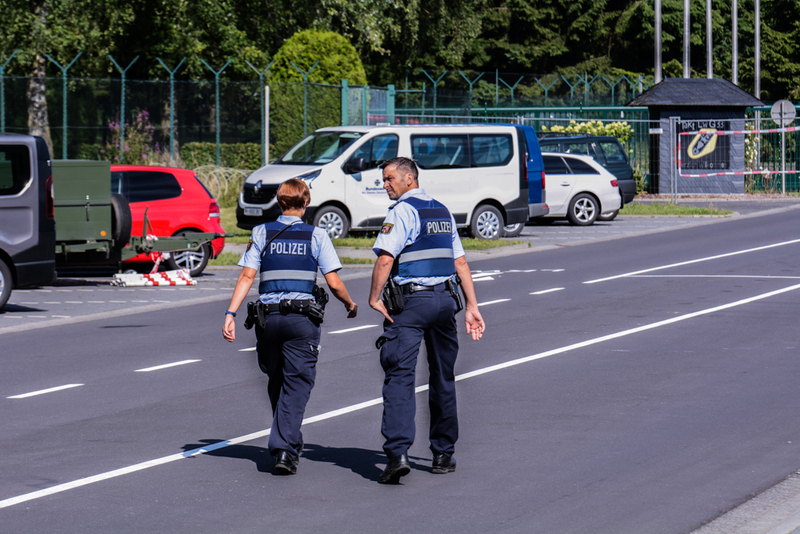 Civilian police were called in to remove Susan and John. Susan Crane was hauled away after refusing to leave. 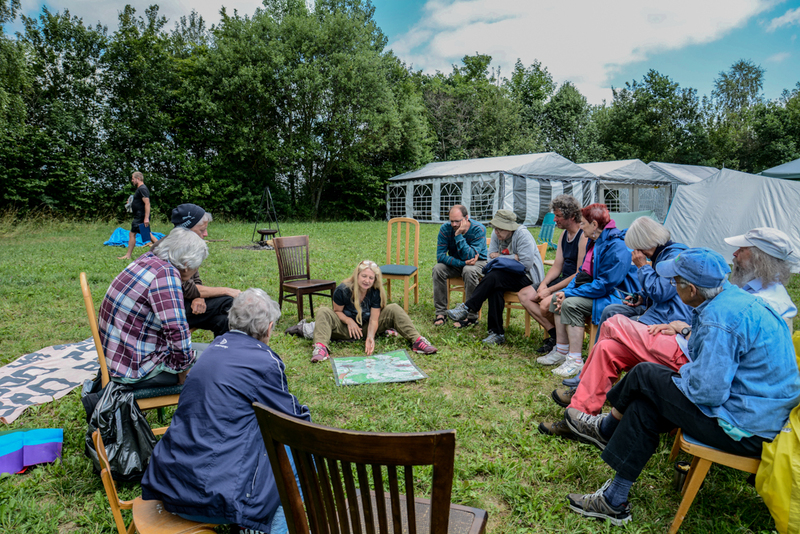 To view more of Zara Brown’s photos from Day 1 click here.